August can provide some mystical mornings in west Michigan. The warmth of the day is undone by the coolness of the night and morning is enveloped in a ground fog. That was the scene that awaited me that morning on the river. Standing on the high bank above the river I could only see the fog that enshrouded the water. It was like a cushion that stifled the sound of not only the stream but of the woods, a gentle hush upon the land. I sat on the tailgate of my Ford Ranger putting on my waders, assembling my 5 weight rod and finishing a cup of coffee while enjoying the stillness of the morning. Mornings like this are to be savored not rushed through. Eventually I wandered down the trail to where I would carefully enter the water and attempt to move with stealth so as not to disrupt any feeding trout. In the past, because I can be as graceful as a three legged elephant, I had spooked some fish within the first 20 feet of my point of entry. Today I was not going to repeat this mistake and so caution was the order of the day. My first cast was to a log jam just a mere 15 feet away and instantly I was rewarded with a nice ten inch rainbow. 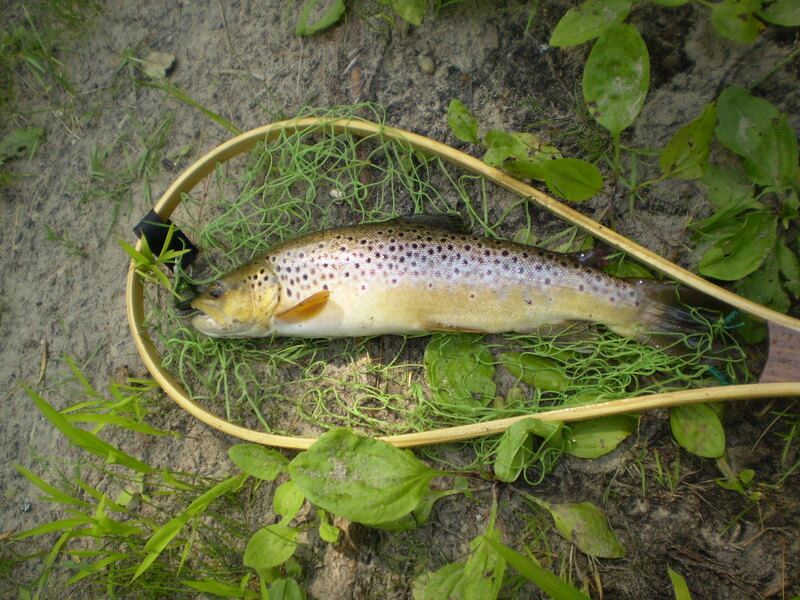 My ego was inflated and as I moved forward after releasing the fish I made an awkward move and spooked a nice trout. Like they say pride goes before the fall. Moving downstream I remembered the first mistake of the day and so proceeded with caution. The mist still hung heavy over the river and limited the visibility of the woods along the low banks. Another cast to a medium depth run produced a fat 16 inch brown. Yes this was definitely going to be a good day. The river to myself and fish actively feeding, what more could a person want. Ahead was a nice run with brush and trees overhanging the river. The only way to fish this very tight area was to move close to the opposite bank and roll cast a fly towards the target and then let it drift downriver. My first cast was met with a heavy strike and the hook was set and I fought to keep the fish from heading down stream. Eventually the fish was brought to the net and released. As the run was not disturbed I made another roll cast to the same area and proceeded to let the fly drift. It was then that I heard that noise. A very low short grunt or was it a growl? This was bear country and my senses told me it was close to the bank where I was and so I tried to see through the fog and listened for another sound so I could zero in on it and identify the source. Unable to locate the sound I moved closer to the bank and strained to see what may be there while not focusing on the river. Suddenly the river exploded as my movement stirred a salmon from his hiding place and my heart skipped a few beats and was in my throat. I sat on the bank knowing that the commotion in the river from the salmon and me sent whatever was on land to the next county. The only question I had to answer was could I steam clean the inside of my waders. This entry was posted in fishing and tagged bears, fly fishing, funny fishing story, rivers, salmon fishing, trout fishing, wading. Bookmark the permalink. Thanks for the comment, it was a great day. I am not a fisherman. But you make it sound like so much fun. Good story. Thanks, I appreciate the comment. Not all items in this blog will be about fishing, I will be writing on issues like travel, camping and life in general as I see it. Your story brought back memories of fishing on the PM with my father (his favorite river, not mine bless his soul). My stream fishing experience never evolved from that short, happy period of time, sad to say, and now I feel I’ve missed something. Thanks for the memories. Maybe I should look for a new pair of waders. Thanks for the comment John,just make sure they don’t leak.